This is an introduction to the writing system of ancient Egypt and the language of hieroglyphic texts. It contains twenty-six lessons, exercises (with answers), a list of hieroglyphic signs, and a dictionary, as well as twenty-five essays on the most important aspects of ancient Egyptian history, society, religion and literature. It also offers scholars of linguistics a complete grammatical description of the classical language of ancient Egypt. This introduction to the writing system of ancient Egypt and the language of hieroglyphic texts is designed as a textbook for university and college classes, and is also suitable for individuals learning ancient Egyptian on their own. It contains 26 lessons, exercises (with answers), a list of hieroglyphic signs, and a dictionary, as well as 25 essays on the most important aspects of ancient Egyptian history, society, religion and literature. It also offers scholars of linguistics a complete grammatical description of the classical language of ancient Egypt. James P. Allen is the Wilbour Professor of Egyptology at Brown University. He is a former curator of Egyptian Art at the Metropolitan Museum of Art in New York and President of the International Association of Egyptologists. His previous publications include Genesis in Egypt: The Philosophy of Ancient Egyptian Creation Accounts (1989), The Heqanakht Papyri (2002), and The Ancient Egyptian Pyramid Texts (2005). 4. 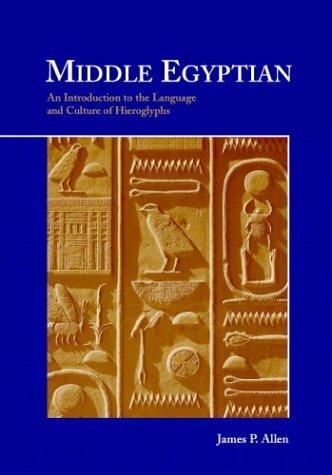 Middle Egyptian: An Introduction to the Language and Culture of Hieroglyphs Allen, James P.